“Breslau” redirects here. For other uses, see Breslau (disambiguation). listen); Czech: Vratislav), situated on the River Oder (Polish: Odra), is the largest city in southwestern Poland. Wrocław was the historical capital of Silesia, and today is the capital of the Lower Silesian Voivodeship. During its history, the city has politically been part of Greater Moravia, early Poland, the Holy Roman Empire, early Bohemia, Austria, Prussia, and Germany, and was ceded to Poland in 1945 as a result of border changes after World War II. According to official figures for 2010, its population is 632,996, making it the fourth largest city in Poland. Wrocław has been selected as a European Capital of Culture for 2016. It will share the title with San Sebastián, Spain. In 2017 Wrocław will host the World Games, a competition in 37 non-olympic sport disciplines. 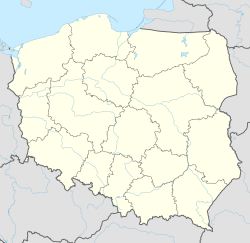 The city's name was first recorded in the year 1000 in Thietmar's Latin chronicle called Thietmari Merseburgensis episcopi Chronicon as Wrotizlawa in connection with the assumption (at the Congress of Gniezno) bishop (one of four in the then Polish). The first municipal seal stated Sigillum civitatis Wratislavie. A simplified name is given, in 1175, as Wrezlaw, Prezla or Breslaw. The Czech spelling was used in Latin documents as Wratislavia or Vratislavia. At that time, Prezla was used in Middle High German, which became Preßlau. In the middle of the 14th century the Early New High German (and later New High German) form of the name Breslau began to replace its earlier versions. The city is traditionally believed to be named after Wrocisław or Vratislav, often believed to be Duke Vratislaus I of Bohemia. It is also possible that the city was named after the tribal duke of the Silesians or after an early ruler of the city called Vratislav. The city's name in other languages is available here. The city of Wrocław originated as a Bohemian stronghold at the intersection of two trade routes, the Via Regia and the Amber Road. The name of the city was first recorded in the 10th century as Vratislavia, possibly derived from the name of a Bohemian duke Vratislav I. Its initial extent was limited to Ostrów Tumski (Cathedral Island, German: Dominsel). During Wrocław's early history, its control changed hands between Bohemia (until 992, then 1038–1054), the Kingdom of Poland (992–1038 and 1054–1202), and, after the fragmentation of the Kingdom of Poland, the Piast-ruled duchy of Silesia. One of the most important events in those times was the foundation of the Diocese of Wrocław by the Polish Duke (from 1025 king) Bolesław the Brave in 1000, which, together with the Bishoprics of Kraków and Kołobrzeg, was placed under the Archbishopric of Gniezno in Greater Poland, founded by Otto III in 1000. In the first half of the 13th century Wrocław even became the political centre of the divided Polish kingdom. The city became a commercial centre and expanded to Wyspa Piaskowa (Sand Island, German: Sandinsel), and then to the left bank of the River Oder. Around 1000, the town had 1000 inhabitants. By 1139, a settlement belonging to Governor Piotr Włostowic (a.k.a Piotr Włast Dunin) was built, and another was founded on the left bank of the River Oder, near the present seat of the University. While the city was Polish, there were also communities of Bohemians, Jews, Walloons and Germans. The city was devastated in 1241 during the Mongol invasion of Europe. While the city was burned to force the Mongols to withdraw quickly, most of the population probably survived. Afterwards, the town was partly populated by German settlers (see: Ostsiedlung), who would eventually become the dominant ethnic group in the following centuries, though the city remained multi-ethnic as an important trading city on the Via Regia and Amber Road. "Breslau", the Germanised name of the city, appeared for the first time in written records. The city council used Latin and German. After the Mongol invasion, the town was expanded and adopted German town law. The expanded town covered around 60 hectares. The new main market square, which was surrounded by timber frame houses, became the new centre of the town. The original foundation, Ostrów Tumski, became the religious center. 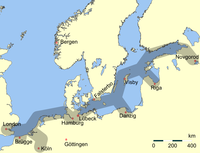 Wrocław adopted Magdeburg rights in 1262 and, at the end of the 13th century joined the Hanseatic League. The Polish Piast dynasty remained in control of the region, but the right of the city council to govern independently increased. In 1335, Breslau, together with almost all of Silesia, was incorporated into the Kingdom of Bohemia, then a part of the Holy Roman Empire. Between 1342 and 1344, two fires destroyed large parts of the city. The Protestant Reformation reached Breslau in 1518 and the city became Protestant. However, from 1526 Silesia was ruled by the Catholic House of Habsburg. In 1618, Breslau supported the Bohemian Revolt out of fear of losing the right to freedom of religious expression. During the ensuing Thirty Years' War, the city was occupied by Saxon and Swedish troops, and lost 18,000 of 40,000 citizens to plague. The Austrian emperor brought in the Counter-Reformation by encouraging Catholic orders to settle in Breslau, starting in 1610 with the Minorites, followed by Jesuits, Capucins, Franciscans and finally Ursulines in 1687. These orders erected buildings which shaped the city's appearance until 1945. At the end of the Thirty Years' War, however, Breslau was one of only a few Silesian cities to stay Protestant. The precise recordkeeping of births and deaths by the city of Breslau led to the use of their data for analysis of mortality, first by John Graunt, and then later by Edmond Halley. Halley's tables and analysis, published in 1693, are considered to be the first true actuarial tables, and thus the foundation of modern actuarial science. During the Counter-Reformation, the intellectual life of the city — shaped by Protestantism and Humanism — flourished, even as the Protestant bourgeoisie lost its role to the Catholic orders as the patron of the arts. Breslau became the centre of German Baroque literature and was home to the First and Second Silesian school of poets. The Kingdom of Prussia annexed Breslau and most of Silesia during the War of the Austrian Succession in the 1740s. After the Seven Years' War, Habsburg empress Maria Theresa ceded the territory in 1763. During the Napoleonic Wars, Breslau was occupied by an army of the Confederation of the Rhine. The fortifications of the city were leveled and monasteries and cloisters were secularised. The Protestant Viadrina University of Frankfurt (Oder) was relocated to Breslau in 1811, and united with the local Jesuit University to create the new Silesian Frederick-William University (Schlesische Friedrich-Wilhelm-Universität, now University of Wrocław). The city became the centre of the German Liberation movement against Napoleon, and the gathering place for volunteers from all over Germany, with the Iron Cross military decoration founded by Frederick William III of Prussia in early March 1813. The city was the centre of Prussian mobilisation for the campaign which ended at Leipzig. Napoleonic redevelopments increased prosperity in Silesia and Breslau. The levelled fortifications opened space for the city to grow beyond its old limits. Breslau became an important railway hub and industrial centre, notably of linen and cotton manufacture and metal industry. The reconstructed university served as a major centre of sciences, while the secularisation of life laid the base for a rich museum landscape. Johannes Brahms wrote his Academic Festival Overture to thank the university for an honorary doctorate awarded in 1881. In 1821 (Arch)Diocese of Breslau was disentangled from Gniezno (Polish) ecclesiastical province and made Breslau an exempt bishopric. The Unification of Germany in 1871 turned Breslau into the sixth-largest city in the German Empire. Its population more than tripled to over half a million between 1860 and 1910. The 1900 census listed 422,709 residents. Important landmarks were inaugurated in 1910, the Kaiserbrücke (Kaiser bridge) and the Technische Hochschule (TH), which now houses the Wrocław University of Technology. In 1913, the newly-built Centennial Hall housed the "Ausstellung zur Jahrhundertfeier der Freiheitskriege", an exhibition commemorating the 100th anniversary of the historical German Wars of Liberation against Napoleon and the first award of the Iron Cross. Following World War I, Breslau became the capital of the newly created Prussian Province of Lower Silesia in 1919. The city boundaries were expanded between 1925 and 1930 to include an area of 175 km2 (68 sq mi) with a population of 600.000. In 1929, the Werkbund opened WuWa (German: Wohnungs- und Werkraumausstellung) in Breslau-Scheitnig, an international showcase of modern architecture by architects of the Silesian branch of the Werkbund. In June 1930, Breslau hosted the Deutsche Kampfspiele, a sporting event for German athletes after Germany was excluded from the Olympic Games after World War I. The 1900 census listed 5,363 persons (just over 1% of the population) declaring to have competent knowledge in the Polish language only, and another 3,103 (0.7% of the population) being also competent in Polish. In religious respect there were 58% Protestants, 37% Catholics (including at least 2% of Poles ) and 5% Jews (counting 20,536 in the 1905 census). The Jewish community of Breslau was among the most important in Germany and several distinguished artists and scientists originated from it..
After First World War the Polish community starting having masses in Polish in Churches of Saint Ann and since 1921 in St. Martin church; Polish consulate was opened on the Main Square, additionally a Polish School was formed by Helena Adamczewska. During the month of August 1920, at the time of Polish Silesian Uprising in Upper Silesia, the Polish Consulate and School were demolished, whilst the Polish Library was burned down by a mob. The number of Poles as a percentage of the total population to 0.5% after the reconstitution of Poland in 1918. . Antisemitic riots occurred in 1923. The changes after WW1 spread nationalistic frenzy among people, who saw their city turn into an advance post of Germany. The city became one of the strongest support bases of the Nazis, who in the 1932 elections received 44% of Breslau's votes, their third-highest total in the entire country. After Hitler's takeover of the German government in 1933, political enemies of the Nazis were persecuted, and their institutions closed or destroyed; in the city the Gestapo began actions against Polish and Jewish students (see: Jewish Theological Seminary of Breslau), Communists, Social Democrats, and trade unionists, arrests were even made for using Polish in public, in 1938 the police destroyed the Polish cultural centre. Many of the city's 10,000 Jews as well as many other enemies of the Third Reich were sent to concentration camps; those Jews who remained were killed during the Holocaust. A network of concentration camps and forced labour camps was established around Breslau, to serve industrial concerns, including FAMO, Junkers and Krupp. Tens of thousands were imprisoned there. The number of Jews remaining in Breslau lowered from 23.240 in 1925 to 10.659 in 1933 . Later Jewish and Polish minorities ceased to exist. The last big event organised by the Nazi Sports Body called Deutsches Turn-und-Sportfest (Gym and Sports Festivities) took place in Breslau from 26 to 31 July 1938. The Sportsfest was held in Breslau to commemorate the 125th anniversary of the German Wars of Liberation against Napoleon's invasion. For most of World War II, the fighting did not affect Breslau. In 1941 the remnants of the pre-war Polish minority in the city, as well as Polish slave labourers organised a resistance group called Olimp. As the war lengthened, refugees from bombed-out German cities, and later refugees from farther east, swelled the population to nearly one million. including 51,000 forced labourers in 1944, and 9,876 Allied PoWs. At the end of 1944 an additional 30,000-60,000 Poles were moved into the city after Germans crushed the Warsaw Uprising In February 1945 the Soviet Red Army approached the city. Gauleiter Karl Hanke declared the city a Festung (fortress) to be held at all costs. Hanke finally lifted a ban on the evacuation of women and children when it was almost too late. During his poorly organised evacuation in January 1945, 18,000 people froze to death in icy snowstorms and −20 °C (−4 °F) weather. By the end of the Siege of Breslau, half the city had been destroyed. An estimated 40,000 civilians lay dead in the ruins of homes and factories. After a siege of nearly three months, Hanke surrendered on 6 May 1945, just before the end of the war. In August the Soviets placed the city under the control of German anti-fascists. Along with almost all of Lower Silesia, the city became part of Poland under the terms of the Potsdam Conference. The Polish name of Wrocław became its official name. There had been some discussion among the Western Allies to mark the southern Polish-German boundary on the Glatzer Neisse; this would have meant that post-war Germany would have been allowed to retain approximately half of Silesia, including Breslau. However, the Soviets insisted that the border be drawn at the Lusatian Neisse farther west. In August 1945 the city had a German population of 189,500, and a Polish one of 17,000 but that was soon to change . Most of the German inhabitants in Wrocław fled or were forcibly expelled from Wrocław between 1945 and 1949 and moved to Allied Occupation Zones in Germany. A small German minority remains in the city till this day, although the city's last German school closed in 1963. The Polish population was dramatically increased by government resettlement of Poles during postwar population transfers (75%) as well as during the forced deportations from Polish lands annexed by the Soviet Union in the east region, many of whom came from Lviv (Lwów). In July 1997, the city was heavily affected by a flood of the River Oder, the worst flooding in post-war Poland, Germany and the Czech Republic. Around one-third of the area of the city was flooded. An earlier equally devastating flood of the river took place in 1903. A small part of the city was also flooded during the flood in 2010. Wrocław is one of the warmest cities in Poland. Lying in the Lower-Silesian region, one of the warmest in Poland, the mean annual temperature is 9.8 °C (50 °F). The coldest month is January (average temperature −0.5°C), with snow being common in winter, and the warmest is July (average temperature 19.9°C). The longest season is summer, which lasts 114 days. The highest temperature in Wrocław was recorded on 31 July 1994 (+39.0°C), and the lowest was recorded on 8 January 1985 (−30.0°C). However, the city is now divided into 48 osiedles (districts). Wrocław is currently governed by the city's mayor and a municipal legislature known as the city council. The city council is made up of 39 councillors and is directly elected by the city's inhabitants. The remit of the council and president extends to all areas of municipal policy and development planning, up to and including development of local infrastructure, transport and planning permission. However, it is not able to draw taxation directly from its citizens, and instead receives its budget from the Polish national government whose seat is in Warsaw. The city's current mayor is Rafał Dutkiewicz, who has served in this position since 2002. Wrocław's major industries were traditionally the manufacture of railroad cars and electronics. In recent years the City Council has run an active policy to attract foreign investors from the high-tech sector. This resulted among others in the location of LG Electronics production cluster in Kobierzyce near Wrocław. After 1989, Wrocław became a significant financial centre and houses the headquarters of several nationwide financial institutions such as Bank Zachodni WBK, Lukas Bank, Getin Bank, and Europejski Fundusz Leasingowy. As of the end of 2008, Wrocław enjoyed a very low unemployment level of just 3.2% compared with the national level of 8.7%. In 2008, per capita gross domestic product in Wrocław came to 27755$ (in Poland 17625$). Wrocław is skirted on the south by the A4 motorway, which allows for a quick connection with Upper Silesia, Kraków and further east to Ukraine, and Dresden and Berlin to the west. The A8 motorway (Wrocław ring road) connect A4 motorway with S8 express road (is being built) to Łódź, Warsaw and Białystok. The city is served by Wrocław International Airport, a river port, the main rail station is Wrocław Główny, which is located next to the central bus station served by Przedsiębiorstwo Komunikacji Samochodowej. Public transport in Wrocław consists of many bus lines and 22 tram lines operated by Miejskie Przedsiębiorstwo Komunikacyjne (MPK, the Municipal Transport Company). In the city there are also corporations Taxicab. Like all of Poland, Wrocław's population is predominantly Roman Catholic; the city is the seat of an Archdiocese. However, post-war resettlements from Poland's ethnically and religiously more diverse former eastern territories (known in Polish as Kresy) and the eastern parts of post-1945 Poland (see Operation Vistula) account for a comparatively large portion of Greek Catholics and Orthodox Christians of mostly Ukrainian and Lemko descent. Wrocław is also unique for its "Dzielnica Czterech Świątyń" (Borough of Four Temples) — a part of Stare Miasto (Old Town) where a Synagogue, a Lutheran Church, a Roman Catholic church and an Eastern Orthodox church stand near each other. Other Protestant churches are also existent in Wroclaw and include: Baptist, Pentacostal, Methodist, Adventist and Free Christians. The Wrocław area has many popular professional sports teams. The most popular sport today is football, thanks to Śląsk Wrocław. In the second place is basketball. The award-winning men's basketball team (17 times Polish Champion). Matches of Eurobasket 2009 to in Wrocław in 2009. Some matches of the 2012 UEFA European Football Championships in Poland and Ukraine are scheduled to take place in Wrocław on The Municipal Stadium. Every year a marathon Wroclaw Marathon takes place in Wroclaw. Śląsk Wrocław — men's football team (Polish Championship in Football 1977; Polish Cup winner 1976, 1987; Polish SuperCup winner 1987, Polish League Cup winner 2009) (Now in Ekstraklasa (Polish Premier League). Gwardia (volleyball) volleyball team playing in Polish Volleyball League (Polska Liga Siatkówki, PLS: Seria A in 2006/2007, Seria B in 2008/2009 season). The CREW — American Football Club — Champion of Polish American Football League 2007, First polish team played in Europen Competitions EFAF Cup in 2008. Devils Wrocław American Football — American Football Club, played in EFAF Challenge Cup in 2009, Champion of Polish American Football League 2010. WTS Wrocław — motorcycle speedway team; multi medalist in the Polish Speedway League (last time Polish Speedway Champion in 2006 season). Impel Gwardia Wrocław — women's volleyball team playing in Polish Seria A Women's Volleyball League. DeLaval Operations Poland Sp. z o. o.
MSI (Micro Star International) Polska Sp. z o. o.
Davies, Norman; Roger Moorhouse (2002). Microcosm: Portrait of a Central European City. London: Jonathan Cape. ISBN 0224062433. Harasimowicz, Jan; Włodzimierz Suleja (eds.) (2001). Encyklopedia Wrocławia. Wrocław: Wydawnictwo Dolnośląskie. ISBN 83-7384-561-5. Kulak, Teresa (2006). Wrocław. Przewodnik historyczny (A to Polska właśnie). Wrocław: Wydawnictwo Dolnośląskie. ISBN 8373844724. Scheuermann, Gerhard (1994). Das Breslau-Lexikon (2 vols.). Dülmen: Laumann Verlagsgesellschaft. ISBN 978-3899601329.
van Rahden, Till (2000). Juden und andere Breslauer: Die Beziehungen zwischen Juden, Protestanten und Katholiken in einer deutschen Großstadt von 1860 bis 1925. Göttingen: Vandenhoeck & Ruprecht. ISBN 3-525-35732-X. Thum, Gregor (2002). Die fremde Stadt: Breslau 1945. Berlin: Siedler. ISBN 3-88680-795-9. Weczerka, Hugo (2003). Handbuch der historischen Stätten: Schlesien. Stuttgart: Alfred Kröner Verlag. ISBN 3-520-31602-1. ^ Johann Georg Theodor (1861). Orbis latinus oder Verzeichniss der lateinischen Benennungen der bekanntesten Städte etc., Meere, Seen, Berge und Flüsse in allen Theilen der Erde nebst einem deutsch-lateinischen Register derselben.. Dresden: G. Schönfeld's Buchhandlung (C. A.Werner). http://books.google.com/books?id=pTgLAAAAQAAJ&printsec=frontcover&dq=Orbis+latinus&cd=3#v=onepage&q=&f=false. Retrieved 10 January 2010. ^ (Polish) Benedykt Zientara (1997). Henryk Brodaty i jego czasy. Warsaw: Trio. pp. 317–320. ISBN 8385660461. ^ "see article "Concentration Camps in and around Breslau 1940-1945"". Roger Moorhouse. http://www.rogermoorhouse.com/article1.html. Retrieved 28 August 2010. ^ "Breslau bonczek sportfest". Sportfest1938.prv.pl. http://www.sportfest1938.prv.pl/. Retrieved 28 August 2010. ^ www.wroclaw.pl (27 July 2010). "History of Wrocław". Wroclaw.pl. http://www.wroclaw.pl/m6852/. Retrieved 28 August 2010. ^ "Festung Breslau (Breslau Fortress) siege by the Soviet Army — photo gallery". Wratislavia.net. http://www.wratislavia.net/festung.htm. Retrieved 28 August 2010. ^ "NTKS Wrocław". Ntkswroclaw.vdg.pl. http://www.ntkswroclaw.vdg.pl/onas.html. Retrieved 28 August 2010. ^ "1997 great flood of Oder River — photo gallery". Miasta.gazeta.pl. http://miasta.gazeta.pl/wroclaw/5,44548,1501462.html. Retrieved 28 August 2010. ^ "1903 great flood of the Oder river — photo gallery". Breslau-wroclaw.de. http://www.breslau-wroclaw.de/de/breslau/postcard/projektor/print.php?showId=1000. Retrieved 28 August 2010. ^ "Główny Urząd Statystyczny". http://www.stat.gov.pl/cps/rde/xchg/gus. ^ "Ranking Szkół Wyższych tygodnika WPROST". Szkoly.wprost.pl. http://szkoly.wprost.pl/?e=49&c=5. Retrieved 6 May 2009. ^ "Ranking Szkół Wyższych tygodnika WPROST". Szkoly.wprost.pl. http://szkoly.wprost.pl/?e=49&c=6. Retrieved 6 May 2009. ^ "Ranking Szkół Wyższych tygodnika WPROST". Szkoly.wprost.pl. http://szkoly.wprost.pl/?e=49&c=8. Retrieved 6 May 2009. ^ "Ranking Szkół Wyższych tygodnika WPROST". Szkoly.wprost.pl. http://szkoly.wprost.pl/?e=49&c=9. Retrieved 6 May 2009. ^ "Home page" (in Polish). Miejskie Przedsiębiorstwo Komunikacyjne. http://www.mpk.wroc.pl/. Retrieved 28 August 2010. ^ "Credit Suisse opens Centre of Excellence in Wrocław". 5 March 2007. http://www.polishmarket.com/47136/Credit-Suisse-opens-Centre-of-Excellence-in-Wroclaw.shtml. Retrieved 3 June 2011. ^ "IBM Opens Service Delivery Center in Wrocław". 13 September 2010. http://www.warsawvoice.pl/WVpage/pages/article.php/13884/news. Retrieved 3 June 2011. ^ "Microsoft opens software development centre in Wrocław". 30 September 2010. http://www.polishmarket.com/92910/Microsoft_opens_software_development_centre_in_Wroclaw.shtml. Retrieved 13 October 2010. ^ a b c d e f g h i j k l "Wrocław Official Website — Partnership Cities of Wrocław" (in English, German, French and Polish). http://www.wroclaw.pl/p/964/. Retrieved 23 October 2008. ^ "Dresden — Partner Cities". © 2008 Landeshauptstadt Dresden. http://www.dresden.de/en/02/11/c_03.php. Retrieved 29 December 2008. ^ "Ramat Gan Sister Cities". http://www.ramat-gan.muni.il/RamatGan/sister-cities/home-page.htm. Retrieved 1 November 2008. This page uses content from the English language Wikipedia. The original content was at Wrocław. The list of authors can be seen in the page history. As with this Familypedia wiki, the content of Wikipedia is available under the Creative Commons License.